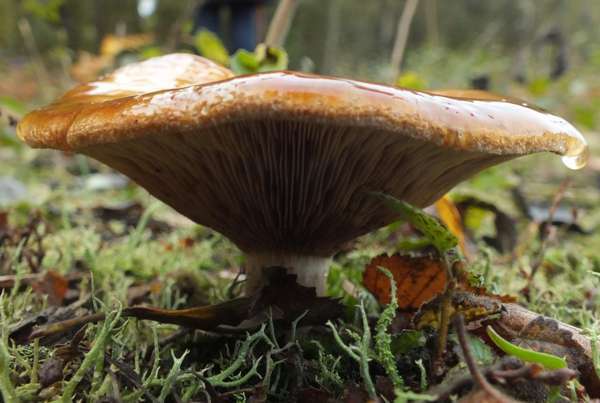 From its general shape this deadly poisonous gilled fungus might be mistaken for a 'funnel' (Clitocybe genus), except that its gills are various shades of brown rather than white, and its spores are brownish where as funnels have white spores. 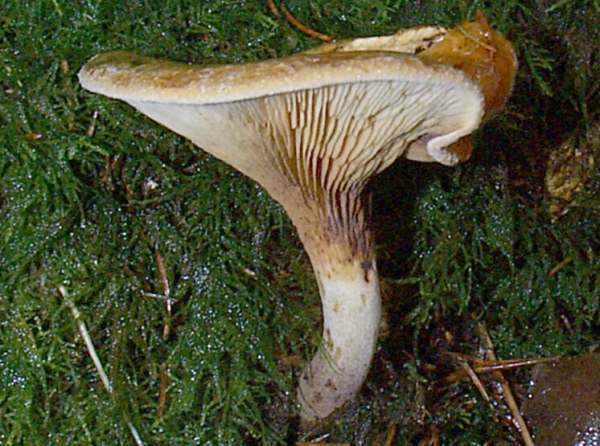 Brown Rollrim (also written Roll-rim or Roll Rim) is classified as a gilled member of the order Boletales, and like the boletes themselves it forms ectomycorrhizal relationships with trees - both hardwoods and conifers. 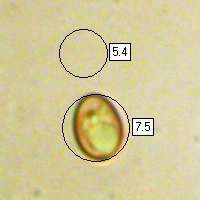 The Brown Rollrim is a cosmopolitan and very common fungus. It occurs throughout Britain and Ireland, and it is also found in most regions of mainland Europe from northern Scandinavia to the southernmost parts of the Iberian Peninsula. 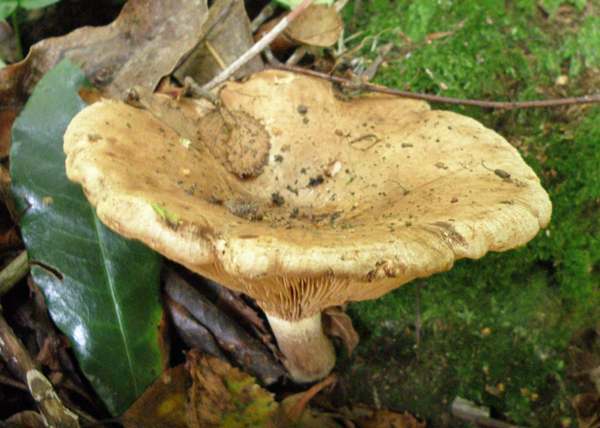 Paxillus involutus is also commonly seen in in Asia, North America, Australia and New Zealand. Although this toxic toadstool was first described in 1785 by French mycologist Jean Baptiste Francois (Pierre) Bulliard, who named it Agaricus contiguus, August Batsch's 1786 description under the name Agaricus involutus is considered the first valid description of the Brown Rollrim. The great Swedish naturalist Elias Magnus Fries set up the genus Paxillus, with Paxillus involutus as the type species, and French mycologist René Maire (1878-1949) later placed the Paxillus genus in a new mycological family, the Paxillaceae. 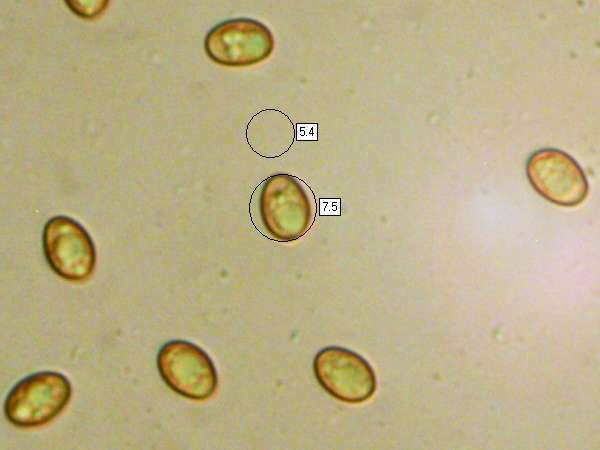 Recently the genus Paxillus has been revised based on the findings of mating studies and DNA analysis, with several species formerly - Classed as Paxillus being evicted - for example Paxillus atrotomentosus, which grows on wood rather than as a mycorrhizal soil-based fungus, has become Tapinella atrotomentosa. The scientific name currently used in the Kew Gardens and British Mycological Society checklists dates from Christiaan Hendrik Persoon's 1801 publication in Syn. meth. fung. (Göttingen) 2: 448. Synonyms of Paxillus involutus include Agaricus contiguus Bull., Agaricus involutus Batsch, Agaricus adscendibus Bolton, Omphalia involuta (Batsch) Gray, Paxillus involutus var. excentricus Massee, and Rhymovis involuta (Batsch) Rabenh. 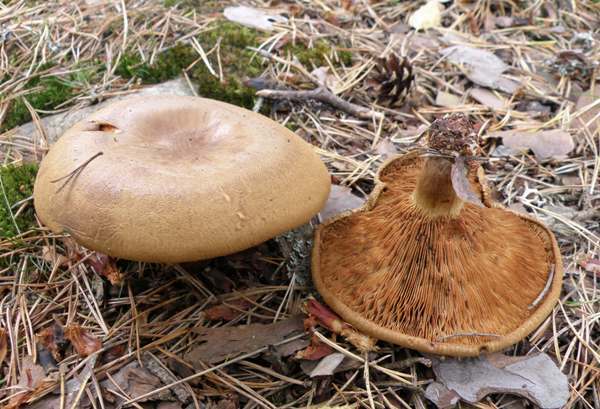 The generic name Paxillus means a 'peg' or a 'small stake', while the specific epithet involutus means inrolled and is a reference to the form of the cap margin of young fruitbodies (evident in the upturned specimen pictured on the left). Several deaths in countries in Eastern Europe have been traced to eating Brown Rollrims, and no doubt many others have gone undiagnosed; this is because the effects of eating this mushroom are now known to be cumulative. Eaten raw or inadequately cooked they can cause gastric upsets because they contain a toxin that is destroyed by cooking; however, that's not the only toxin in these mischievous mushrooms. There is evidence that some people can eat Paxillus involutus without any obvious adverse reactions over many months or even years until, suddenly, they show an extreme allergic reaction and suffer from the potentially fatal effects of haemolytic anaemia (an abnormal breakdown of red blood cells by an as yet unknown toxic component of these mushrooms that can result in kidney damage and liver failure). Initially convex, the ochre cap soon becomes centrally depressed, occasionally with a noticeable umbo, and gradually turns chestnut brown. The margin remains inrolled - hence the common name Brown Rollrim (or Brown Roll-rim) - and it usually has a fluted edge. Downy in dry weather, the cap surface is viscid when wet. 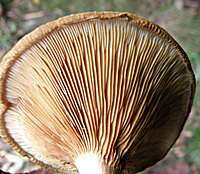 Caps expand to between 5 and 12cm when fully mature, and the downy surface becomes smooth when the caps are very old. Pale ochre at first, the gills gradually turn brown as the fruiting body ages. Rusty spots appear, and if the gills are bruised they very rapidly turn rusty brown. The crowded gills are deeply decurrent. 8 to 12mm in diameter and typically 6 to 12cm long (but nearly always curved), the stem is more or less parallel sided and light ochre at first, becoming chestnut brown with age or if bruised. Ellipsoidal, smooth, 7.5-9 x 5-6µm. Odour not distinctive; taste acidic. Note: the Brown Roll-rim is now known to be a poisonous species and may even be deadly. Mycorrhizal, under birch and other broad-leaved trees, particularly where the soil is acidic. Paxillus rubicundulus P. D. Orton (syn. Paxillus filamentosus) is very similar in macroscopic characters but has smaller spores (5.5-8.5 x 4-5μm); it is mycorrhizal with Alders (Alnus species). 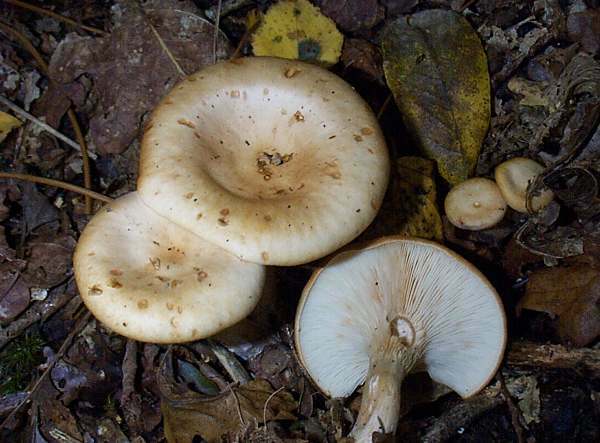 Tapinella atrotomentosa (formerly Paxillus atrotomentosus), commonly referred to as the Velvet Roll-rim, is a somewhat larger species with a velvety cap and a thick short stem covered in dark brown down. It appears on and close to conifer stumps.